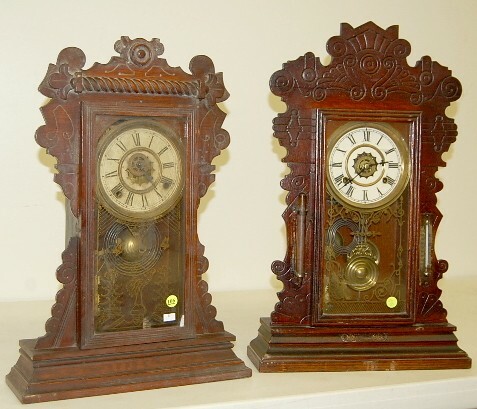 2 Waterbury Clocks: "Mansfield" and "Gibson" 1.) Waterbury oak "Mansfield" kitchen clock; time, strike and alarm; 5" unmarked painted tin dial; has key; no pendulum; stork and butterfly decorated glass door; marked movement. (Dial not attached to clock, also discolored and crazed; 1 hand missing; case wear; door latch missing.) 21 1/2" 2.) Waterbury oak "Gibson" kitchen clock; time, strike and alarm; 5 1/2" unmarked paper dial with Roman numerals; has key and pendulum; dragon decorated glass door; running. (Barometer and thermometer look bad; case wear; dial may be replaced.) 24"